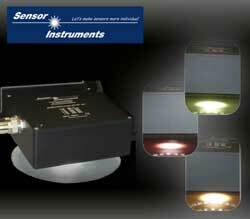 Sensor Instruments GmbH: Usually the color checking of color paint during production primarily is done in a laboratory. A paint sample is taken, and the color of this sample is then checked by way of a thin paint layer in dry condition. This process of course takes some time, time in which paint production might run out of the permissible tolerances and thus might require time-consuming and expensive follow-up treatment. It would therefore be highly desirable to have information about the color quality of the product directly after the dispersing of color pigments into the carrier material (binder system and diluting agent). An inspection glass therefore was integrated in the production line to allow an optical check of the already mixed color paint. A Sensor Instruments SPECTRO-3-28-45°/0°-MSM-ANA-DL color sensor then was positioned before this inspection glass at a distance of approx. 20mm. The ring-shaped, similar-to-daylight light that is installed at 45°, and the vertical (0°) position of the true-color detector ensure that there are no unwanted reflections at the inspection glass surface which might affect the measuring accuracy. The color sensor provides color data with an accuracy of dE=0.3. In addition to the SPECTRO-3-Scope MSM-ANA parameterisation software, a monitoring software also is used here. On the PC monitor this software shows information about the color values and their trend and also displays if one of the color values should exceed the tolerance limit. Data are also saved in a file together with date, time, and production-specific information. The three analog signals (4mA … 20mA or 0V … +10V) that are available at the output furthermore can be used to control the color production process.